In a society where the claim that we can know absolute truth is dismissed as ridiculous, and moral standards are disregarded if they interfere with personal enjoyment, the church is under threat in two ways. Tired of swimming against the tide, it can be tempted to throw away its commitment to biblical standards of behaviour and to the uniqueness of Christ as the only Lord and Saviour in the quest for social acceptability. At the same time, in a longing to see God at work in revival and the desire to be seen to be successful, Christians may be open to accept anything that causes a sensation and attracts a crowd, even if it departs from the biblical gospel. The epistle of Jude was written to combat false teaching which in many ways encapsulates all the worst dangers to the church and the biblical gospel today. John Benton urges his readers to regain Jude's vision of contending for the faith, not just at the intellectual level, but at the level of responsible Christian living and practical, loving Christianity for those led astray. John Benton is the pastor of Chertsey Street Baptist Church, Guildford, England, and the author of several books, including two other titles in the Welwyn Commentary Series, Losing Touch With The Living God (Malachi), and Straightening Out The Self-centred Church (Titus). 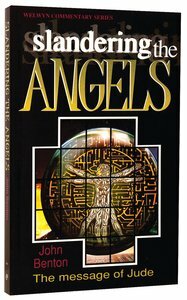 About "Slandering the Angels (Jude) (Welwyn Commentary Series)"
This popular series provides clear and concise insight into the Scriptures from respected authors, many of whom are pastors and Bible teachers. The series presently covers 34 OT and 25 NT books of the Bible and are ideal for personal study, Bible class and sermon preparation and are highly commended. John Benton is pastor of Chertsey Street Baptist Church, Guildford, England and Managing Editor of the monthly newspaper, Evangelicals Now. John & his wife Ann have written many books; some as a joint venture. They are in demand as conference speakers. Andrew Stewart, minister of Geelong Reformed Presbyterian Church, follows up his excellent commentary on 1 Chronicles, providing clear and concise insight into 2 Chronicles and its message of God's faithfulness to his covenant promises. The popular Welwyn Commentary Series provides clear and concise insight into the Scriptures from respected authors, many of whom are pastors and Bible teachers. Currently covering 26 Old Testament and 20 New Testament books of the Bible, these accessible and highly practical works are ideal for personal study, Bible class and sermon preparation. Worthy of the widest readership. In the story of the kings of Israel and Judah, we see God pointing people to the coming King of whom Solomon, in all his splendour, was only a faint and imperfect picture. This carefully written and helpful study is suited to teachers and preachers, as well as students and general readers. 272 pages, from Evangelical Press.